Officers, one of whom fatally shot a 24-year-old man on Thursday, were responding to a 911 call about him being armed with a handgun and using a knife to slice his chest, according to the Santa Clara Police Department. At a news conference on Friday, Capt. Wahid Kazem said, however, that the man dropped a “bloody” knife along the path he used when trying to flee from police. Also, officers didn’t find a gun. They didn’t know either of those things when dealing with the man, though, he stressed. The deadly incident began around 5:10 p.m. Thursday when police responded to a call from an apartment unit on the 2200 block of Deborah Drive. The call came from one of the man's parents who told police that their son was armed, had cut himself, and was barricaded inside his bedroom, police said in a statement. The man had climbed out of his bedroom window by the time officers arrived, police said. 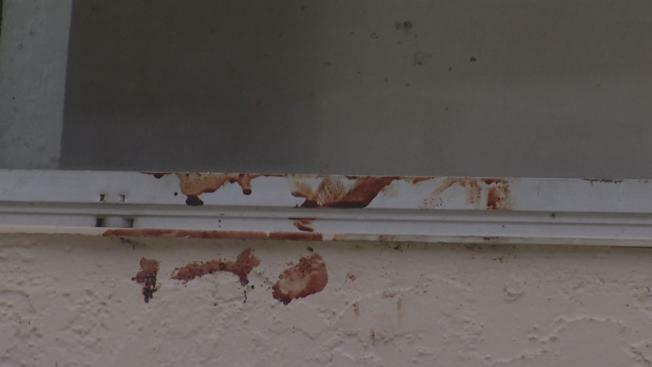 Neighbors told NBC Bay Area he had left bloody handprints on a back window of the house – a sight that photos from the scene appeared to confirm. When officers located the man by a retaining wall along nearby railroad tracks, he threatened to shoot officers and himself, police said. Officers tried repeatedly to subdue the man and offered him medical aid, but he refused. An officer even deployed his Taser, but the move did not help to deescalate the situation, according to police. Police ordered the man several times to show them his hands, but he disobeyed, they said, instead advancing in Officer Colin Stewart’s direction. The 13-year veteran, who was wearing a body-worn camera, was afraid for his life and shot the man, who died. No officers were injured, police said. Neighbors told NBC Bay Area that the man may have had a history of mental health issues and drug abuse. Kazem said at the news conference that officers had been called to the same house earlier Thursday on reports of a disturbance within the family. That call involved the man, who was later shot, Kazem noted, declining to provide further details. Detectives from the Santa Clara Police Department and investigators from the District Attorney’s Office are jointly investigating the shooting, according to police.